Triumph wowed us all when they beat all the Japanese manufacturers to putting a fuel injected engine in to a 600cc sportsbike. Shame about the glitches. Later Triumph TT600s are better but the handling and brakes have never been in doubt: they’re awe-inspiring. Dodgy looks but a true Brit. 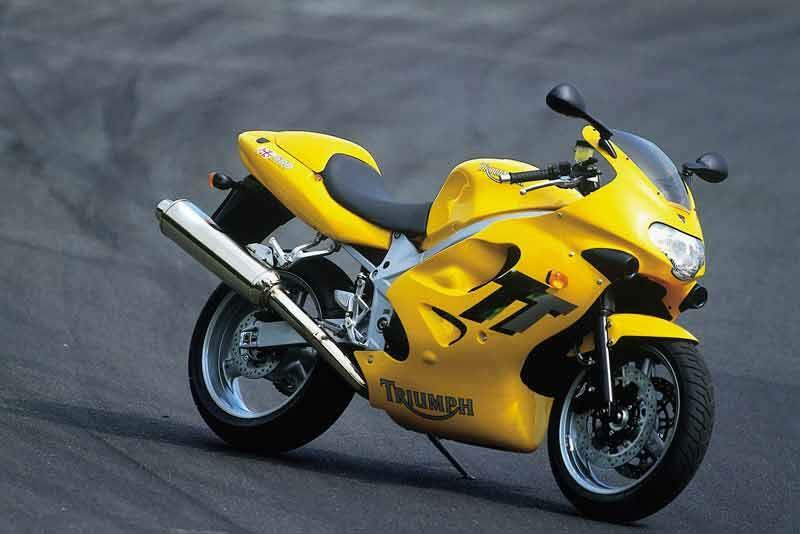 Pre-2001 Triumph TT600 models suffered a marked lack of power low down and too much throttle hesitancy. After tweaks, there was considerable improvement but, alas, the Triumph TT600 already had “a reputation” by then. Higher up, things are different, with plenty of usable welly. You have to rev it hard to keep on it but it’s good fun trying. With Nissin calipers, Sagem fuel injection system and Kayaba suspension, some very decent parts went in to the making of the Triumph TT600. Finish, overall, is very good even if the styling’s come in for considerable criticism. Bolt heads and other exposed Triumph TT600 parts show wear quite early on, though. The Triumph TT600's small screen works pretty well and the seating position’s on a par with the not-too-extreme Honda CBR600F. Triumph TT600 has funky clocks include a white-faced, analogue tacho with digital speedometer plus clock and trip meters. Good mirrors, a realistic tank capacity and a selection of aftermarket parts from Triumph. 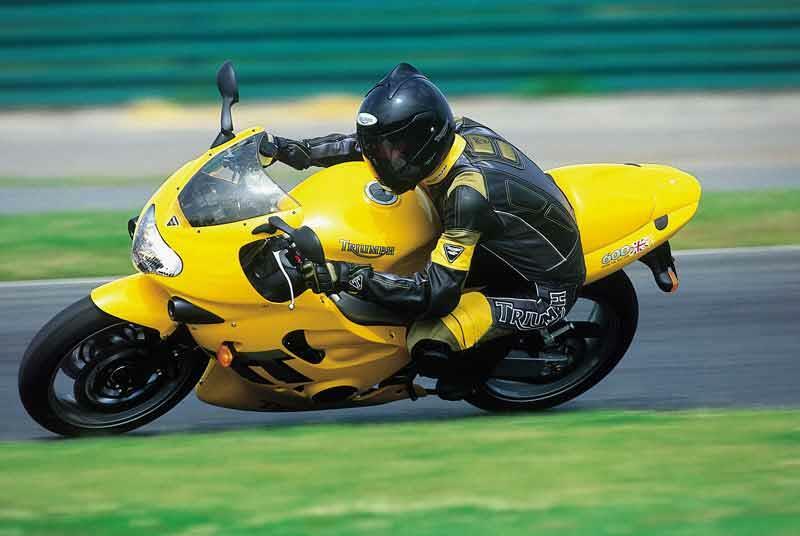 2000: Triumph TT600 launched. The verdict was the braking system and handling were top notch but looks and power delivery were widely slated. 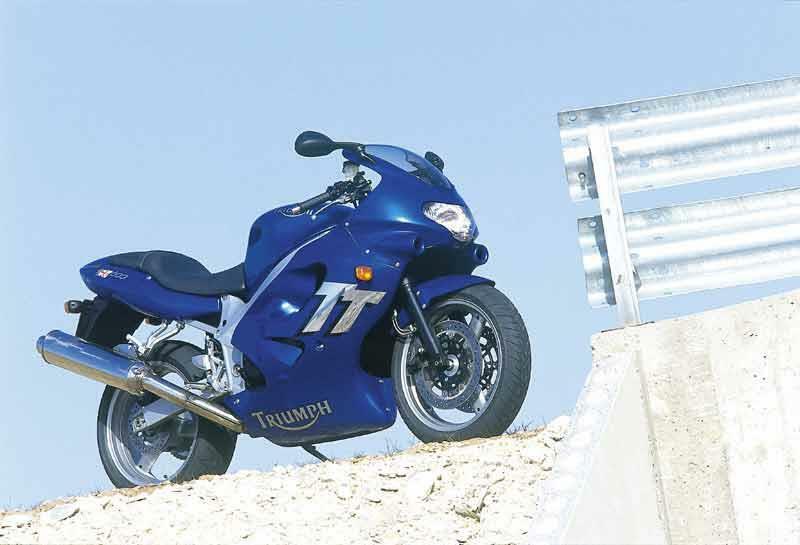 2001: Triumph made numerous modifications to the Triumph TT600's engine: aiming to maintain power at the top end whilst smoothing out power delivery and giving it more pull lower in the rev range. There was a vast improvement. 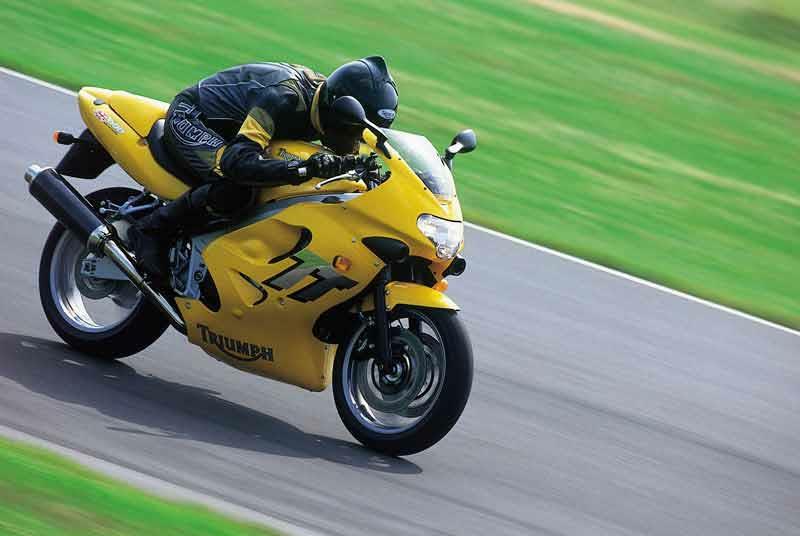 10 owners have reviewed their TRIUMPH TT600 (2000-2003) and rated it in a number of areas. Read what they have to say and what they like and dislike about the bike below. Not at its best in traffic, but fine at town speeds. Not too much weight on the wrists in town. 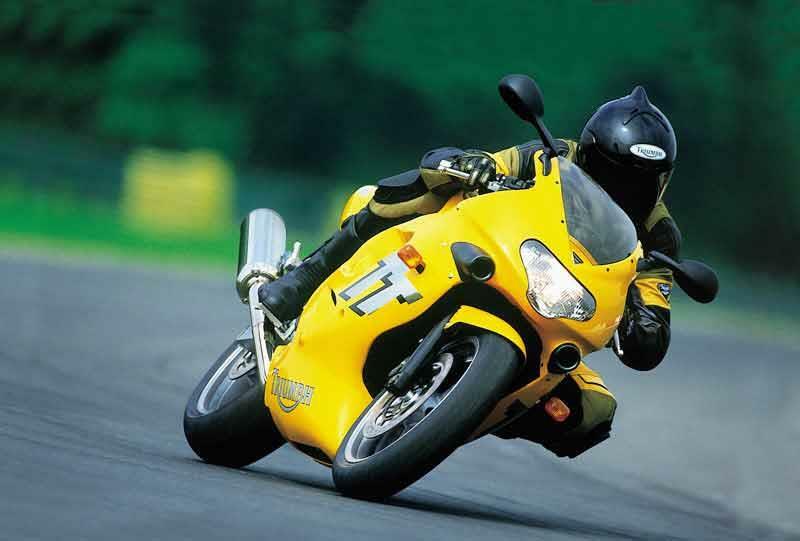 Best on open A roads or a track where the handling and brakes can really be used. Brakes are dynamite, big front twins are great, just grab a hand full of lever and pulls up true every time. Fantastic confidence building cornering particular on Battaxes or M7RRs, light weight can keep pace with the 1000cc crew, out corner most riders dreams. Engine likes min 3000rpm for slow street work, commuter 4000-5000 is very sweet, highway work 5000-7000rpm will get you booked in Australia, fast ridevthru the gears 6000-10,000rpm is ideal. Trackwork... would not abuse a classic... get a 675 modified Daytona. OK... so they are a bit 'ticketty' all dog boxes are, all clutches make noises, all engines have tappet noise, so what... but oh what a sweet 4 cyl engine, good street power from 3000rpm, hard puller over 7000 and full on 100hp at 11,000rpm... what more you want. If you have an early version, just add the factory upgrades and it seems fine. Don't ride till warm up min 75degC. Quality build, easy repair, looks always good, true classic now, ride it sensibly and fast its fine, really Triumph did well on this design and it was so good it carried through to other models. I am a mechanic, so no problems, Triumph parts cost more because its a class brand, bit like TVR, Aston Martin. Good maintenance is essential for all bikes. Use ONLY full ester synthetics oils 15/50, regualr filter changes every 2000kms, use clutch like a slipper clutch for 1st & 2nd gear then quick changes its fine. Easy to change big clutch. All you need for a street fighter. Version : The not really running good version? When it's running I give it a 5 out of 5 but since you should probably be a mechanic to own one because I have issue after issue with mine. When I push it to the top of a hill and coast it to try and get it pop started thing rides as smooth as can be. Unfortunately I am Fred Flinstoning it more times than riding it when it is self propelled. That is a bit harsh, the bike handles great and me being a new rider I love that it is unique. The brakes are great and I have never been in fear of my life even when people that can't drive try to cut me off and then slow down and turn off in front of me. I feel like I have total control of the bike when I ride it so A+ to ride quality and riding experience. Has a good bit of pickup and pep when running. Im a large guy at 6'-1" 240 and it had plenty of power and pickup going up hills. Hahaha, if the bike feels like running, and you go through the proper sequence of doing a dance, turning the key on and off four times bumping the tank in just the right spot with the palm of your hand and not touching the throttle at all and praying to the proper gods then the bike might start and run for a bit until you put it in gear. There are orhter 600s that get much better gas milage, this one is at about 30mpg and I am not really a hot rodder. You can't put a value on your time, if you enjoy working on something alot and throwing parts and money at problems and loading the vehicle up and taking it to a very hard to find Triumph shop and not really being able to commute anywhere because you know the potential of being stranded is about 50% then the cost of owning a lemon is pretty high up there. If you enjoy riding a motorcycle you should probably steer clear of this bike. My favorite feature is the fantastic gas cap that has no ability to seal the inside of the tank from outside elements. I keep the bike covered all the time in my driveway yet after every rainstorm I love that I have to tank the tank off and drain it and drive my truck to the gas station, fill up gas can, take it home, do a dance and pray that the bike turns over. If it does by some miracle turn over and gets warmed up, don't waste time putting your gear on, as soon as you twist the throttle the bike will laugh at you and quit running. I purchased my bike with 15000 from a shop in downtown Richmond with miles on it in 07-08. Had nothing but bad experiences, in and out of the shop so I gave it to my father who was more mechanically inclined. After two ok years of riding, as in 50% reliability it eventually just stopped starting and sat for a couple of years under a car port. I have recently assumed control over the bike and wished that I would have just bought something else. Just got my bike out of the shop a couple of months ago and it ran like a champ until it just didn't anymore. It now has 16500 miles on it and everyone just keeps saying I "need to ride it more", I would daily drive it if I could rely on it starting. The good news is that I should be a certified Triumph mechanic by the time I can finally get this thing running consistently. 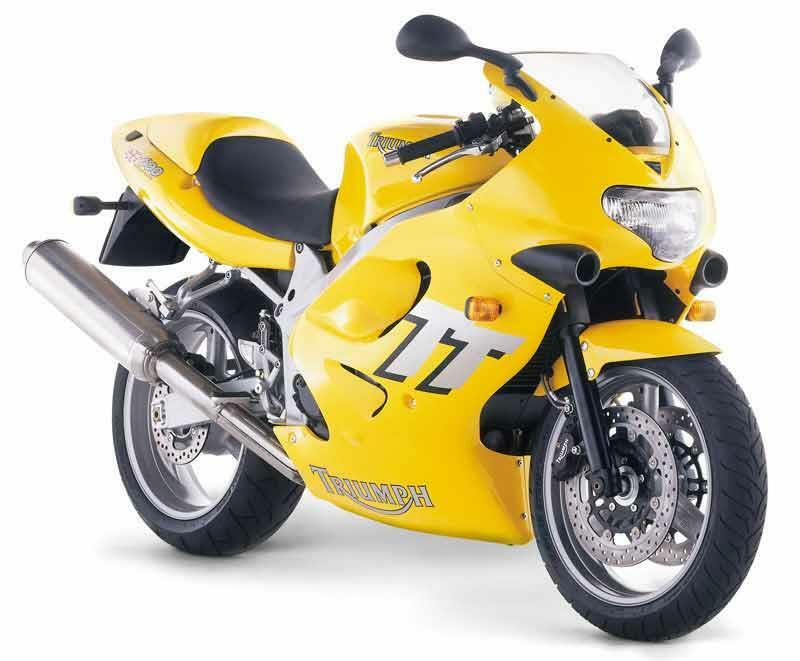 Bought this in may 07 after selling my ZX10(1990 version). I wanted something that would handle and reach the speed limit so I bought this after a short relationship with a Laverda Diamante. I'd had it for a week the went on a journey to portsmouth, 225 mile trip with only one stop. The TT crusied at a bit above the limit (90 to 100) all the way down (and back) and when I arrived I wasn't aching which was a good sign and not the sort of thing I was expecting from a sportsbike. The fuel injection issues have been sorted on this bike as it's one of the later models and appears to be better than a GPZ900 I once had. One of the shocks I had was MPG, I get about 150 from a tank and when the light comes on I have about 40 mile left, this does depend on how you ride it as I have run out once, on the plus side the bike was easy to push. I do miss a proper gauge which tells me the fuel level. Handling is excellent with dunlop D207s, may get even better with more expensive rubber but if it works why change it. Everyone seems to go on about the sharp brakes but this is something I haven't noticed when compared to my previous bikes. The engine is revvy and quick, produces plenty of power, I sometimes miss the brute power of the ZX10 as you have to think about changing down a cog when you want a bit of power but I have come down in cc to just over half so that would be the same on any of the batch of 600s. 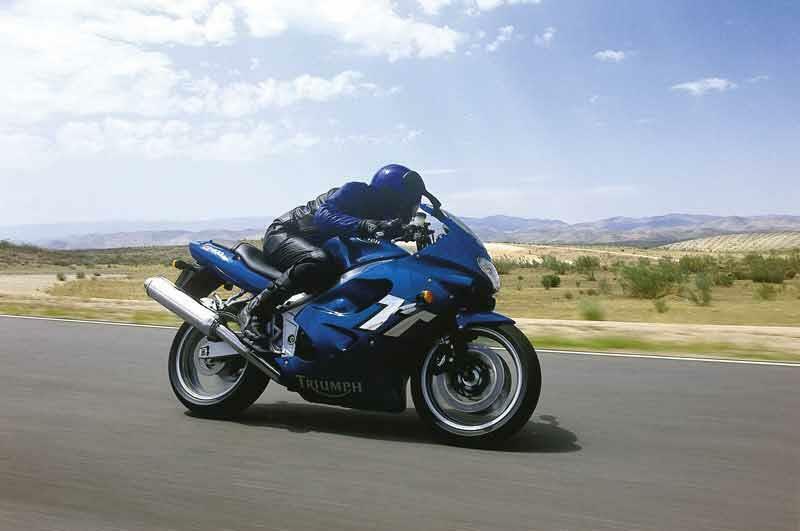 I think the bike was unfairly slammed for the low down fuel issues, this bike was never made for city riding, it was designed for the open roads like many of todays sportsbikes. 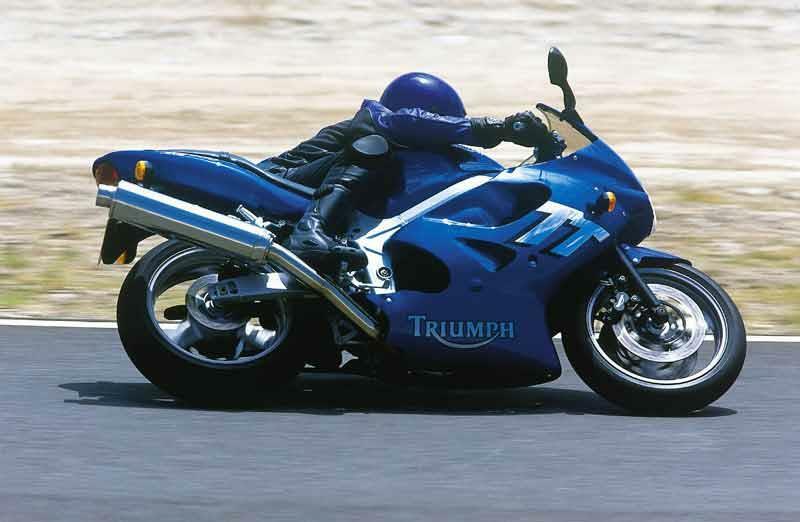 The triumph feels and looks like a bigger bike, people often miss the 600 on the tail section and ask the cc. 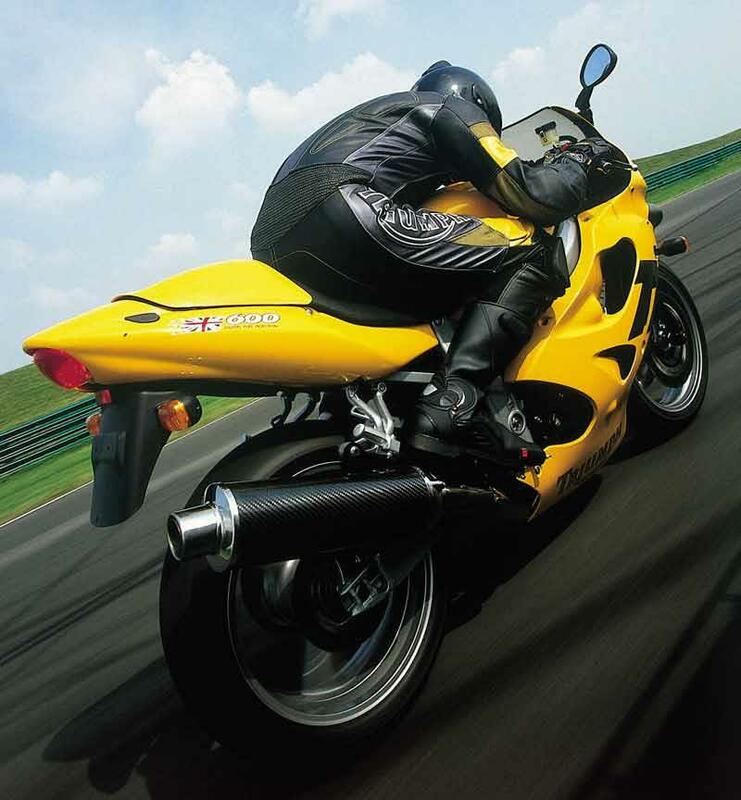 the riding position is not as extreme as some of the other 600s The bike does every thing within my limits as a rider, it's comfortable on a long ride, breaks the speed limit, stops well and goes round corners very well. It also has something the other 600s don't, it's british and it always get people looking at it thanks to the name on the tank. Highly recommended. This was my first bike after passing my DAS, and I've done about 12k in 9 months in all weathers and its been great. I've even done some two-up touring! Its a bit lumpy below 4krpm but you're hardly ever that low in the revs so it doesnt really matter that much. Its comfy enough for 4-500 miles a day(i'm 6 foot tall) and forgiving enough for an inexperienced rider. And it says made in Britain on it!!! 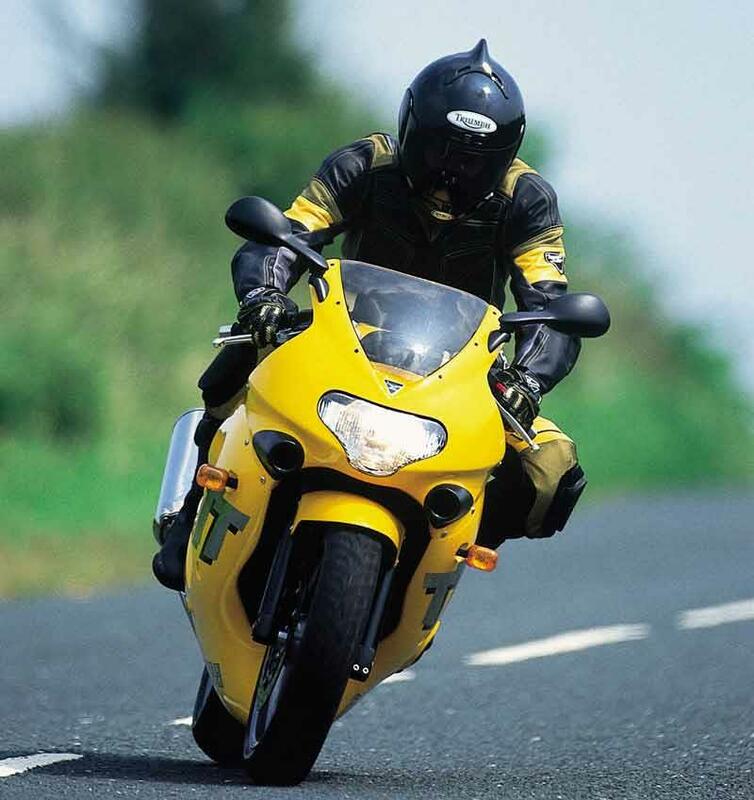 The TT600 is a top bike, the ride & handling is excellent and is very forgiving if you make a hash of a corner. I've ridden her in all weathers and she has never let me down. She’s even done her fair share of touring! The looks not to everyone’s taste (but that also goes for the rider :) but she does stand out against the rest among the rows of blue and white gsxr’s. If they still made the TT600 and I was in the market for buying new, I would get another one without question. Brought as first bike. Couldn't ask for a better bike to learn all the basics on. Top end not as good as the cbr rr or gixer. Bought my black TT from Robinsons Foundr, Canterbury, Kent in Oct 2004, just prior to passing my and I haven't looked back since. I do 600 miles a week in all weathers and the bike hasn't missed beat. The Sagem injection unit had its obiligatory remap by the dealer when I first bought the bike, but apart from normal consumables nothing has gone wrong. 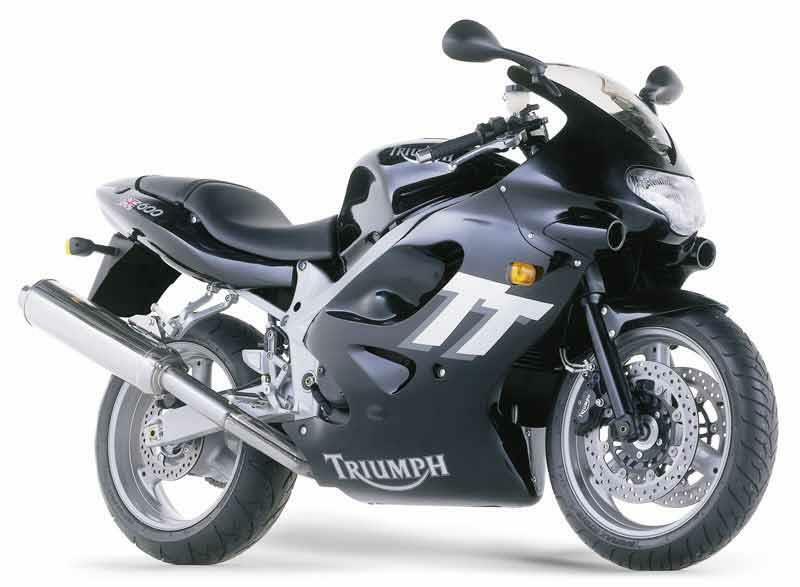 I have been so pleased with Triumph in general that I'm about to swap it for a 955i. Strengths: Reliable. Easy to ride with no unexpected behaviours when braking, cornering and accelerating. Fast without being intimadating. Comfortable over distance. Different. In comparion to Jap bikes the TT600 is great value for money. Decent build quality. Weaknesses: Needs a double bubble screen if you're going to do a lot of motorway riding. The looks are not to everyones taste, but that is often a case of "champagne tastes and beer pockets"!. Paint around the ignition key easily scores (now I'm being really fussy!). This is a superb all round bike. I had no problems with the fuel injection until I put on an ART race can. However, the extra power and sound are worth the odd cut out at low speed. The bike is very comfy to ride (I am 6ft 1") The power delivery is fantastic. I have done two track days on it and blown away 95 percent of everyone there, so the bike is more than capable. This is probably due to the awesome brakes. I have changed the rear sprocket to give more accelleration, added a k&n air filter, race can, rear hugger, seat cowl, double bubble screen and a few other minor things. [IMG]http://img.photobucket.com/albums/v282/TT600/bike.gif[/IMG]. Strengths: Brakes, brakes, brakes, suspension, power delivery. Weaknesses: What weaknesses?